The world is changing. It is going forward and forward. The Internet is on the driving seat and is taking the world ahead and ahead. In this era of smartphones, use of internet has boosted with several layers. Almost the whole world has now become smart to use smart devices with the help of the internet. Web developers used to search; What is "Mobile-First Indexing"? What does it mean to be mobile first? What is an index on Google? Why mobile-first indexing is so important? 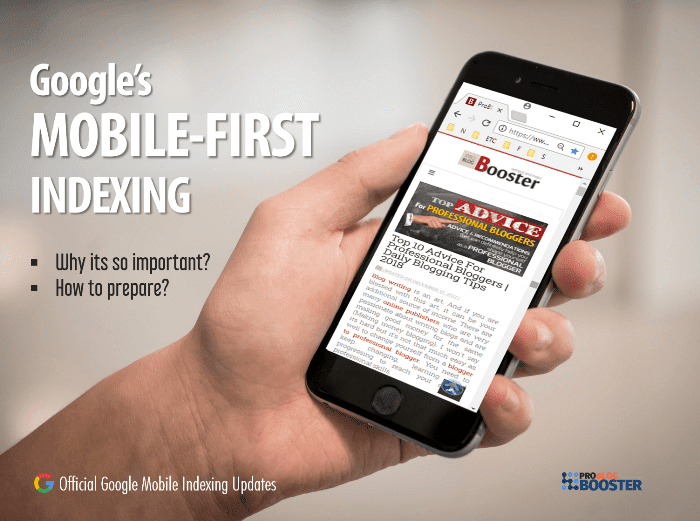 How to prepare for mobile-first indexing? How to optimize the website for mobile first indexing? How does mobile first index impact the SEO? In this case, if any business wants to be in the picture to drive traffic, generate leads and gain some handsome profit, then it becomes a high priority to remain at a reach of the customers. Don't forget the last 2 – 3 years, the people have turned to online shopping over traditional; and that's too; through their smart devices! It This won't be wrong if I say; it is long back, the computers were used to shop online. From the day, when the cost of the smartphones started coming down, people started replacing their old handset with the new smarter devices. They are now very internet savvy users tends to use their mobiles all the times for their online activities. This resulted in the need to have mobile-friendly apps and websites. The Google, world’s top ranking internet service & search engine, has taken a decision to go for a mobile-indexing. Earlier when computers were used for online shopping, it was computer indexing. But as more and more people are using mobiles for online requirements, the Google has turned to update to the mobile-first indexing. One survey stats that; more than 58% of all traffic is derived from the mobile devices, and this trend will continue to grow in coming years. Mobile-first indexing made it easier for the smartphone users, to open the website quickly. It gets opened on every sized smart device very easily and effectively. This is because of Google’s shifting towards mobile-friendly indexing for the website. The fact is now, the business needs to get adjusted with this new algorithm. Here are the tips to make your site mobile-first index friendly. Let's see; all about mobile-first indexing; why it's so important and how you prepare for Google's mobile updates? If your readers are switching more and more toward the mobile devices and so the mobile visits are increasing each year, then as an online publisher you must consider providing the mobile-friendly experience over the desktop from today onwards. The mobile-first indexing is the advanced evolution of Google’s modern efforts to create the web more mobile-friendly and follows user behavior requirements. Mobile-first indexing is searching and ranking the mobile version content. Currently, the Google create and rank its search listing index based on the mobile version of the content. A new announcement from Google is a step towards the world of mobile. No matter, the listing is displayed on the mobile or on the desktop. From 4 November 2016, Google has started using the mobile version of the web as its primary search engine index. Why mobile-first indexing is so important? Today, the smart world is raising and it will keep moving ahead. Plus online shopping through mobile is increasing. In such situation, the websites need to be designed more and more mobile friendly to follow the user trend. If you able to see the traffic analysis of your website, you might notice the increase in the traffic from smart devices. As the name suggests "mobile first" indexing - the sites which are built to have mobile-friendly designs are having a better ranking and are likely to serve on a priority basis in the search results. If you don't have a responsive mobile-friendly version for your website, your desktop versions can still be indexed in search results. But the absence of mobile-friendly version could cause a negative effect on your search ranking. So it's better to switch and design the mobile version as early as possible that would able to get higher search ranking even for desktop search results. It’s a time to get prepared for the new era of mobile-first indexing. So, make sure that your website is optimized to work best on the smartphones and smart devices. In technical words, Mobile-first indexing is nothing but the Google has crawled the web from a desktop browser point of view and now changed the same to mobile browser view. This is really an important shift in the indexing. And it’s a time to take the shifting seriously. To offer great user experience, it is important to accept this drastic change. Here are some recommendations that can help in preparing for this move. First of all, it is necessary to know whether it is required to have to change anything. If your site is the dynamic serving site or is a responsive site and primary content is equivalent across desktop and mobile, no need to change anything. On the other hand, if your site has a site configuration and if the primary content is different across desktop and mobile, it is the time to consider making changes for shifting. In this situation, it is recommended to consider following changes to your site. Make your site sure to serve structured markup for desktop version as well as for the mobile version. Avoid a large number of markups while adding structured data to the mobile site. Do not make changes to the canonical links. If suppose you are a website owner and has verified the desktop site in "Search Console", then must consider verifying it for the mobile version too. While you are shifting from desktop indexing to mobile-first indexing, always keep in mind that a functional desktop-oriented site is always better. It is much better than having a broken or incomplete mobile version of a site. Make sure to run a mobile-friendly test so as to ensure your website is optimized for mobile use. You can refer Google’s primary mobile guide for how to optimize the site. If any third part is hosting your site, you can check its working through Google’s how-to-guide. Optimizing the website for mobile first indexing. Preparing for the new era of mobile-first indexing is the need of the day. It is thus vital to work on mobile optimization and planning for such kind of drastic change. There are many things the business needs to prepare for. It is the time to run a mobile-friendly test. It is time to ensure that the website is optimized for mobile use. If the site has already mobile responsive design, you need not have to make any changes to correlate with Google’s latest mobile indexing announcements. If the markup of the site and site’s content are different on desktop and mobile, make changes in the site’s configuration. You can take online assistance for that matter. It is necessary to go for structured data tests for both (mobile+desktop) the URLs. It is necessary to run robots.txt testing tool in order to make sure that mobile version of the site is accessible to Googlebots. Googlebots is the key for indexing and thus needs to be considered very urgent. If the site does possess any canonical links, then there is no need to make changes. You can continue to use these links to serve the appropriate results. The links can be used to provide right results to the user searching either on the mobile or on the desktop. If you are constructing the website for the first time, it is always recommended to go for building mobile-friendly designed website structure. The same suggestion is for if you have already a site, but wants to create a fresh site for mobile. The only thing needs to be considered is design the site and make it fully functional for desktop as well as mobile screens. Launch it after it is designed to be fully functional. If possible, avoid it launching too soon. Before you launch the site; check for its quality and compatibility for mobile use. For any queries or any doubts, in respect to mobile-first indexing, it is advisable to contact Google Webmasters. Google Webmasters are always there to serve you with the best possible outcome. Moreover; if needed seek help from the Google’s Webmaster tool (Search Console). Shifting from desktop indexing to mobile-first indexing is a need of the day. It is going to take time for the Google to make this change in prioritizing mobile indexing. So, you have ample time to get prepared to face new announcement. In the mean-time, you can start preparing and optimizing the website towards the new path. No doubt, it will be more challenging to get shifted to mobile-first indexing. For that matter, it is recommended to hire the expert professional so as to make your site mobile savvy. Or you can seek help from Google’s Webmaster tool. It is the best way to get shifted to a new era of mobile-first indexing.